The nominees for the first annual Cancer Bites (a national blood cancer awareness and education campaign launching on Halloween) Fright Night Awards have been announced, and both Daniel Radcliffe & The Woman in Black are nominated. 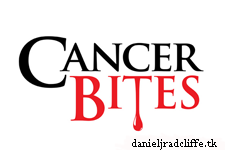 Cancer Bites has enlisted the Leukemia & Lymphoma Society (LLS), Lymphoma Research Foundation (LRF) and the Multiple Myeloma Research Foundation (MMRF) to help fuel its mission. As the nation's leading blood cancer patient advocacy organizations, LLS, LRF and MMRF will play an integral role in the campaign at every level: funding research to find effective new treatments and cures; connecting patients and their families to free educational information; and providing support services for patients at every stage of their cancer journey. The awareness campaign will encourage the public to support their efforts to beat cancer.